Funny how a bunch of hiatus riddled manga series returned this month. Certainly made writing this monthly manga review that little bit harder. 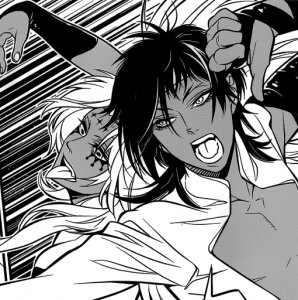 I won’t trouble you with the details, just know that Gate 7 and D.Gray-man are finally back from hiatus and Half & Half is gracing us with one of its irregular releases. Let’s end the year right with a look at all of these new monthly chapters. 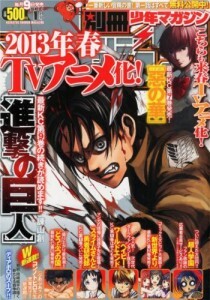 Before I go into the chapter, just a reminder that Spring 2013 will bring with it a Shingeki no Kyojin anime by what looks mostly like Production I.G! As usual I have no complaints with this series. No surprises here that this was yet another decent chapter, and one that nicely ends Shingeki no Kyojin‘s 2012 performance. 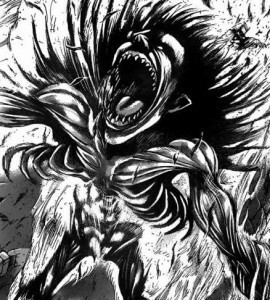 It may have been predictable that Ymir has titan powers, but the way it was handled was quite lovely. A flashback to the origins of his relationship with Christa was a move well-played. Not only does it serve to deepen our knowledge of the many characters of this series, it also brought up quite the interesting development: it’s not just those with titan powers that are keeping the secrets. We also learn a little more about Christa, who’s acting more normal than you might think. With the mindset of the story being “sometimes sacrificing yourself is the greatest contribution you can make,” people like her should exist. Between choosing your own death and not knowing when you’ll die, its natural that some people take it into their own hands because they’re not able to withstand the pressure of possible death at any minute. Understandably so, when the human race is in danger people stick together. Even if they are titan-hybrids, friendships tend to last this test because the world is too harsh to alienate any one person that is close to you. Of course that also breeds hate and prejudice from people like Connie and Reiner, who undoubtedly hold a grudge against a lookalike. Thought-provoking as always, this series is fantastic and I’m counting the days till April. Last thought of the year: I forgot that Ymir was a girl…….whoops. 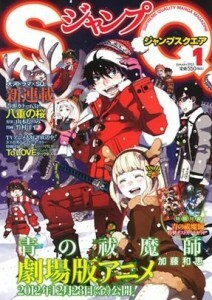 Kimi ni Todoke was probably the only series in this review that actually had a Christmas theme to it. Considering all the manga I usually review for this post, I’m not surprised. Very cutesy, very high school and very heart-warming. Beyond that description, I’m left wondering what else I could possibly say that’s remotely insightful about this chapter. Short answer: nothing else. Long answer: keep reading and I may string along a few more thoughts. The whole girl talk part of the chapter was the core comedy. Including the snippet I used, there were many funny moments that revolved around Chizuru being teased a little by Sawako and Ayane. Chizuru is always in the centre of the comedy in my opinion, so this chapter was nothing new or unexpected. It also made for some adorable Sawako artwork; Ayane is cute too but not as obvious as Sawako. So D.Gray-man has been on hiatus for a few months, which explains why I completely forgot about. Even so, this chapter doesn’t make a case for it to be memorable. Kanda was asked to take Cross Marian’s position as general. Jasvedi made an appearance! Haven’t seen them in a while (since the Noah arc if I’m not mistaken). Apocryphos finds himself assaulted by Jasvedi, with the outcome pending. I was actually quite happy with the Jasvedi vs Apocryphos part of the chapter. Not only was it fun to see the crazy Noah duo back in action, but it’s also a step in the right direction in terms of where the story is heading. My problem was with Kanda’s half of the chapter. A big let down in some ways. Him being asked to become a general was so anti-climactic to this chapter that I was genuinely upset it wasn’t made a bigger deal out of. Shonen clich s like that should be used in my opinion, just so we can remember big events such as this one. Now I’m going to struggle to remember this as a big moment in the series simply because it wasn’t made out to be a big deal. At least the series is back. Let’s see if I can remember it the next time round. You can tell that Half & Half is a Seo Kouji manga after reading this chapter. Given the time constraint this series has, the events of this chapter are hardly surprising. If you were surprised, then remember that Seo Kouji’s bread and butter is indeed teen drama. Finding your girlfriend in bed with your best friend is right up his alley in terms of story. Makes sense that the main character was betrayed by his girlfriend. Now that he’s broken up, it creates new complications for the two as their time is running out. Before, it would have been likely for Yuuki to consider giving up her life because Shinichi has a girlfriend but now if they get attached to each other, that creates a while new dilemma. Suffice to say that Half & Half is going just as one would expect it to: a Seo Kouji romance drama with much pain in store for the main character(s). 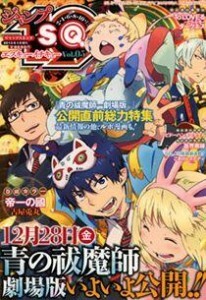 Joining D.Gray-man in a return to Jump SQ is Gate 7. Looks like CLAMP’s small hiatus is over and we’re back to normal…for now. Quite a lot going on in this chapter. Iemutsu brought along a comrade by the name of Sen-hime, who I’m willing to bet is as ruthless as he. It’s times like this that I wished for a better knowledge of Sengoku era history, nevertheless I am left with little to say about this new character. Other than that, there was the discovery of a broken barrier surrounding Urashichiken. An eventful chapter no question, but with the pacing it didn’t feel like much happened. Relatively speaking, these two events are quite important but the majority of the chapter felt very carefree. Whether an explanation of the barrier would have helped or not is debatable, and it may have given the chapter a little sense of urgency. You can tell this was an important chapter, yet I wish it had a sense of urgency to it. Frankly speaking, Gate 7‘s return to Jump SQ was as uneventful as D.Gray-man‘s. Unlike the latter series, this one just didn’t do enough with what it set out to do and ended up with a sub-par chapter at best. It could have been a lot better, but failed in execution. There’s something very PG about this chapter. Whenever a manga running in Jump (Weekly or SQ) decides to have a chapter dedicated to “friendship, effort, victory,” a part of me wants to cringe. In AoEx‘s case, I’m a little confused because I thought Shiemi and Kamiki didn’t need a revisit. In general, I find this tendency to constantly re-examine the relationships within AoEx quite frustrating. We’ve already had the Okumura brothers’ relationship put through a test once again and now we’re back to examining each of the other characters. It wasn’t until the end that anything new happened. As you might expect with a series about an act of religiously purging demons, the Illuminati pops up. Yes that organization that has been used in our favourite conspiracy theory literature is now contributing to the manga about the son of Satan who aims to be an exorcist. Let’s see where the story heads. Hopefully nowhere too “conspiracy theory” focused. The fight continues to build up with each chapter, to the point where it’s reaching the climax. Now we’ve gotten to the point where the real fight is about to start. The abyssal ones, Claymores and former Claymores have all started to make their move. A certain confrontation scene pictured above, has led to some pretty interesting developments; mainly that the former Claymores have now decided to join the fray. A bit of action at the start, to be followed by all these events really shows that Claymore is gearing up to enter another big arc. These fights have been expected for some time now, and with the return of Clare there is no time but the present to start them. How the fights will turn out is anyone’s guess at this point. There are two main fights that will eventually influence the final showdown, so both have a weight of importance on them. Of course the Claymore’s fight will receive more attention, but the other fight holds a lot of importance also. 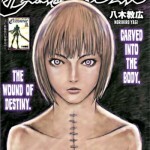 Claymore’s fake end earlier this year may have been a mistake, but a real end is plausibly in sight as we start progressing through this final arc. Oh, those adorable Kimi ni Todoke girls. I'm also guessing that Claymore is in the final stretch, since that's usually what happens when every main character is in one spot like this. I've noticed it happening in a couple other series too, like Soul Eater and Rosario + Vampire, so the pattern is pretty familiar. Yeah it's a familiar feeling. Don't really mind as long as everything is covered.